Kelly's proposal shock rounds off a moving day! The first couple to move into the latest Nantwich residential development have celebrated by getting engaged on the very first evening they spent in their brand new home. 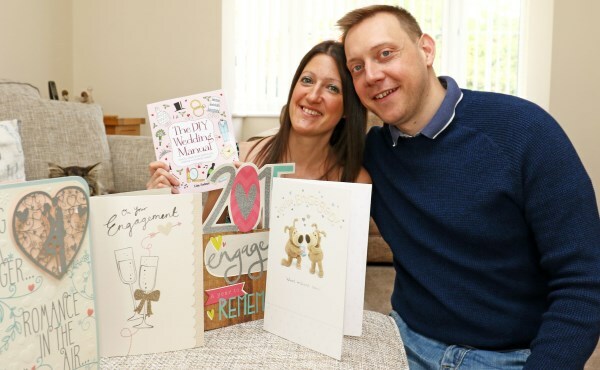 Andy Bibby, 34, surprised girlfriend Kelly Holland, 36, by popping the question at the end of a busy day moving into their new detached four-bed home at Bovis Homes' Malbank Waters location. After the final box was in, the couple settled down to enjoy a glass of champagne and to read some of the congratulations cards from friends and family. It was then that the big moment came. Kelly said: "It was a very perfect moment. We had just moved into a house we had been so excited about, having been able to watch it being built. We had moved all of our belongings into the house, and were finally able to sit in our new lounge, just the two of us with a glass of champagne. I opened a card from my friend saying it would be my year and when Andy read it he said that he thought so too. He then got down on one knee, pulled my beautiful engagement ring out of his pocket and asked me to be his wife!" Her answer was a delighted 'yes' and the couple, who have been together for 16 years, are now due to marry in September next year. They previously lived in Wistaston, and were the very first buyers to reserve a property at Malbank Waters, choosing a Canterbury housetype off-plan because of the extra space it offered them and their cats Dougal and Jolly. They have now become the first residents to move in and Kelly added: "The buying experience has been brilliant and we adore our new house, which is close to Nantwich and all the great local amenities such as the town centre, the canal and the beautiful countryside. "After searching for six months we were attracted to Malbank Waters because of the quality of Bovis Homes and in particular the Canterbury property. We especially love the bay windows and the open plan kitchen diner, which makes the house very social and flowing. "I would particularly like to thank Kate and Barbara from the sales team, as well as the site manager, Scott. The site tidiness is second-to-none, as is the security and safety." For more information on Malbank Waters and Bovis Homes visit www.bovishomes.co.uk.